Here’s the sketch, final painting and lettering for the front jacket of Jack and the Giant Barbecue. 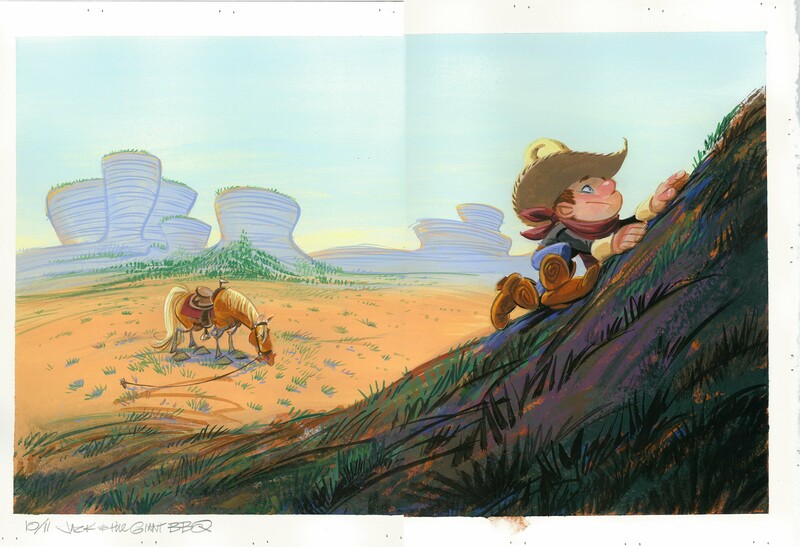 Here’s the final painting from my last post—Jack climbs Mount Pecos in Jack and the Giant Barbecue. Masking fluid (or liquid frisket) is a pretty handy item to have around. Many of the scenes in Jack and the Giant Barbecue have characters in front of the big, wild & woolly American West. I like to spread out and paint that kind of backdrop with equally wild brush strokes. That’s a whole lot easier if you don’t have to carefully paint around the characters. Masking fluid is kind of a rubbery syrup that you paint on your paper wherever you don’t want watercolor. It dries to a water-repellant film. As you see in the pictures, I masked out Jack and his faithful pony (also using bits of masking tape) so I could slather on the paint with abandon.When I finished painting the background, I peeled away the mask using a rubber cement pickup. Another night-time party scene from Let’s Have A Tree Party! A thumbnail sketch, tight sketch, the painting in progress and the final illustration. My former student Julia Kapp assisted with blocking in the big areas of color for this book. As anyone who has worked with gouache can tell you, laying down a perfect velvety blue sky isn’t so easy. This image and the paintings from the previous 2 posts will be part of the ArtisTree exhibit in the Graffiti Gallery—that’s in Oil City, Pennsylvania. It’s supposed to be a beautiful day tomorrow, so come on over for the Transit artists’ Open Studios (noon – 5:00) and stay for the gallery reception (4:00 – 7:00). Here’s a night-time scene from Let’s Have A Tree Party! The sun’s gone down and the animals say ‘hi’ to the moon. Thumbnail sketch, tight sketch, some shots of the painting in progress and the final illustration. Here’s the copyright/dedication spread for Let’s Have A Tree Party! from Candlewick Press. It’s the first big image you see, so this is the establishing shot. It tells you where the story takes place.